Click for help or call 1-888-316-7297 We are available 24/7! Large: 17.5" x 15" x 8.5"
We're here 7 days a week between 9am - 10pm EST! Together, we help shelters spend less on food, so more can be put into healthcare, rehab, and housing. Every bowl you donate through each order goes a long way towards helping pets in need across the country get care and find loving homes. Enter your email address to hear about our exclusive sales and offers! 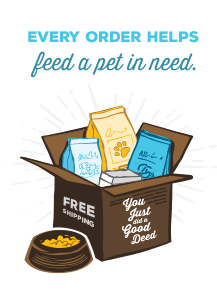 With every box we ship, a bowl of food is donated to a pet in need. Billie Jean is extremely easy-going and a go-with-the-flow pup. Though Billie Jean is always up for playtime, she is also content just snoozing on the couch with you. She loves to get close and LOVES getting scratches. With this girl’s striking bright blue eyes and fluffy cream-colored coat it’s next to impossible not to immediately fall in love! Some say her expressions are reminiscent of a certain “grumpy cat”, but don’t be fooled...She’s a sweetheart! If there was a Golden Girls reboot, Izzy would get cast for sure! This senior gal pal just loves to hangout and be part of the group. She’s smart, funny, and loves treats! Marty likes having his space, but he’s very easy to please. He just wants a bit of attention, a cushy bed, and of course...food. Marty LOVES his food and he’s great at letting you know when it is dinner time! Monroe is a confident woman and knows how to communicate what she wants. This little lady believes she is the queen of her domain so if you follow the protocol, you will be on your way to becoming her loyal subject! If personality could be weighed, Sweetpea would have tons of it! She is friendly and mellow and gets along with everyone in her foster home. She is great with other cats and will go right up to well-behaved dogs. Like a fine spirit, Whiskey just keeps getting better with age! Whiskey is full of boundless love, loyalty, and affection. Yabba Dabba Doo can’t wait to be your new best friend! He loves to cuddle, chase his tail, and is obsessed with toys. Where are my prescriptions coming from? To fill your prescription orders, PetFlow has joined forces with VetSource. VetSource is a fully accredited, Vet-VIPPS certified national pharmacy located outside of Portland, Oregon. VetSource is fully licensed in all 50 states to properly handle and dispense pet related medications. We partnered with VetSource because unlike the other major online pharmacies, VetSource is one of the only major pharmacies that partners directly with your vet. Because of this structure, they are also one of the only major online pet pharmacies that acquires medication safely and directly from pharmaceutical companies. Prescription medicines will come in a separate shipment directly from VetSource’s Pharmacy in Oregon, while the rest of your non-pharmaceutical purchases will come in a PetFlow box from our warehouses. Is PetFlow a licensed pharmacy? No, PetFlow is not a pharmacy. Through our partnership with VetSource, we’re able to display the medications you need, and have them fulfilled and delivered through VetSource, a fully licensed pharmacy, Vet-VIPPS certified from the National Association of Boards of Pharmacy. The National Association of Boards of Pharmacy (NABP) has approved PetFlow as an Internet advertiser of prescription drug-related services through its e-Advertiser Approval Program. VetSource, Inc. Licensed pharmacy in all 50 states.